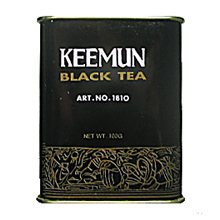 This exceptional Black tea is made entirely of young Hao Ya, Keemun's finest grade of tea leaves. The bright amber infusion has an appetizing honeyed sweet aroma while the taste is wonderfully smooth and with a light hint of floral aftertaste. It comes in a tin can for easy storing.